Prithviraj Sukumaran born 16 October 1982 in Trivandrum, Kerala, India, to Malayalam actors Sukumaran and Mallika. His elder brother Indrajith Sukumaran and sister-in-law Poornima are also film actors. 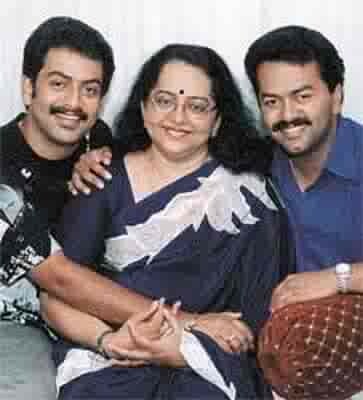 You can find young Prithvi with Father Mother & Brother in these photos. Tamil Nadu Summer Special Trains 2011 Schdules. Click the pictures to view in large text. Khushboo, a Muslim, married actor-director Sundar C, a Hindu, and converted to Hinduism after the two got married. They have two daughters, Avanthika and Ananditha, after whom they have named their production house. She has been living in Chennai for the past twenty years. She also has three brothers all of whom also live in Chennai.She is one of the most popular and friendly co-stars. Phone: 2817 1345, 2817 4757. P.R.O: Mr. Palanikumar. Cell: 98410 66456. Phone: 2466 0688, Cell: 98400 31003. Phone: 2433 6555, 2436 3143. Mobile: 98840 99414, 98404 97819. Phone: 2498 4337, 2498 5595. Mobile: 56113337, 94440 43337. Phone: 24819195, Cell: 98410 06268. Ph: Cochin: 0484 - 2318228, 2315750. USA: 650-3431900, 650-2182811 Cell: 94473 56440. Chennai - 600 092. Ph: 2376 5306, 2376 5141, 3118 3074. Phone: 2473 3341, Cell: 3250 5065. Manager: Giri Phone: 2472 8127. Cell: 98410 91827. Santhuru (P.R.O): 98403 99925, 33388861. Phone: 5585 3829. Cell: 3090 6899, 3202 9755, 3102 9755. Manager: Mr.Sethu - 3116 7108. Phone: 2376 0097, 2649 1244. Phone: 2498 2940(R) Cell: 98410 10660. Manager: Mr.Rajesh - 98403 73882. Phone: 2362 1113, 2362 0798. Cell: 98410 23942,31030360. Phone: 2470 0069, Mobile: 98401 63831. Ph: 2596 3942. Cell: 310 69626. Chennai - 92 Ph: (R) 2376 7323. Cell: 3376 7323. Phone: 2626 2906. Cell: 98410 60604, 98840 36399. Phone: 2551 6988, 25569961, 20040600. Phone: 022 - 2592 1101, Mobile: 98204 92265. Chennai: Manager: Mr.Giri - 98410 91827. Contact No: Skathi - 2466 1440. Joby - 098461 77633. Phone: 3268 7744 Mobile: 5529 8902, 31037832. Phone: 2377 4050 . Cell: 31166247. Manager: Mr.Giri Phone: 2472 8127, 2484 6621. Cell: 98410 91827. Phone: 2433 3259, Cell: 98413 72522. Phone: (R)2445 5766, 2441 1514. Phone: Office: 2826 7128, 2822 5474. Manager: Mr.Giri - Mobile: 98410 91827. Phone: 2436 1081(R), Cell: 98402 76498. Ph: (R)2498 3626. Cell:31160224, 98840 60442. Phone: 2441 6575, 2441 7755 Cell: 98410 46547. Phone: 2489 2873 Cell: 31001700, 98410 74422. M.G.R.Nagar, Chennai - 600 078. “Just Call” Phone: 2371 6115. Phone: 2472 8127, 2484 6621. Manager: Mr.Giri - Cell: 98410 91827. Phone: (O) 2814 2616. Cell: 98842 77780. 98402 88564. Phone: 2441 9475, Cell: 98841 70809. Chennai - 600 012. Cell: 94440 57773. 2nd Floor 8, Vadapalani, Chennai - 600 026. Phone: 2480 4230, Cell: 31087089, 98403 41335. Phone: 5204 7558 Cell: 98411 74990, 32666354. Phone: 2376 4370, 2376 4031. Mobile: 94441 15559. P.R.O: Mr. Govindaraaj. Cell: 98412 83050. P.R.O: Mr.Govindaraj. Cell: 98412 83050. Chennai - 600 018. Phone : 2435 8628, Cell : 31115224. Kamdar Nagar, Nungambakkam, Chennai-600 034. Saligramam, Chennai - 600 093. Phone: 2499 1908, Cell: 98410 18576. Venkatnarayana Road, T.Nagar, Chennai - 600 017. Phone: 2436 1078. Cell: 98401 17077. Santhuru Manager & PRO. : Cell: 98403 99925, 3338861. Manager: Mr.S.Nazeer: 2490 2609. Cell: 98400 87316. Chennai - 600 090. Cell: 98410 31941. Phone: 2495 4065, Cell: 98410 81677. Ph: 2815 1311, 2815 2509, Mobile: 098400 68623. Manager:Mr.Giri-98410 91827. Phone: 2484 6621, 2472 8127. Phone: 23743643, 23744070, Cell: 98410 82123. Jubilee Hills, Hyderabad - 500 033. Cell: 044-32720447 040-33333359, 098490 11777, 28260464. Manager: Mr.Vimal. Cell: 044 - 3242 5269. Chennai - 600 092. Tamilnadu, India. Colony, 2nd Street, Kodambakkam, Chennai - 600 024. Cell: 98410 26535, 98840 26535, 31101315. P.R.O: Mr.Santhuru. Cell: 98403 99925, 33388861. Off: Ranga Road, Mylapore, Chennai - 600 004. Phone: 2376 7273, Cell: 98412 46645. R.A.Puram, Chennai - 600 028. Phone: 2656 3835, 2550 6333. Mobile: 31018094. Tele Fax: 23766672 Cell: 98410 86444. Kerala: 98460 52011. Phone: 2486 3219, Mobile: 98410 50401. Cell: 32694881. Phone: 2362 1244. Cell: 98411 66103, 98404 45821. Manager: Mr.Venkatesh - 5615 8450. Phone: 2376 2116, Cell: 94441 91987. Ph: 2486 7277(R), 2486 8638. Cell: 98840 22102, 98404 22102. Phone: 2814 0131. Cell: 94440 21031, 98410 36158. P.R.O: Santhuru. Cell: 98403 99925, 33388861. Phone: 2486 2002, 5548 4475, Cell: 98410 73266. Chennai-600 017 Phone: 2434 5375. Phone: (R) 2836 1107, Mobile: 98411 39369. Ph: 98402 45901, 98401 30479. Phone: 2484 7970, Cell: 98410 18170. Ph: 26511846, 26511859 Cell: 98410 16048, Hyd: 040-23403732(R). jai Nagar, 5th Street, New No.1. 1st Floor. Phone: 24759242. Cell: 98401 28944. Phone: 2471 3323, Cell: 98410 51368. Manager: R.S. Sundar Phone: 3109 7685. Phone: 2670 1959 Mobile: 98410 75260, 3110 9016. Phone: 080 - 2273947, Cell: 098450 56456. Phone: 2814 0482, Mobile: 98410 41150. Phone: (R)2271 6270 2223 8501. Ph: (O)28151880, 55196672. (R) 24364241. Manager: Mr.Mahalingam Cell: 98840 54668, 3112 1065. Ph: 2819 1897, Cell: 98400 76695. Phone: 2434 3489, Cell: 98400 80380. Phone: 2433 6460, 2433 6459. Cell: 0044-79 31706097 0044-77 96800949. Phone: 2484 6621, 2472 8127. Phone: 2847 4455(R), Cell: 94441 10999. Phone: 2374 3945, Cell: 98402 41555. Ph: 2473 0699, 2480 0587 Cell: 98403 41335. Phone: 2618 6645 Cell: 98410 55656, 98410 12288, 31036248. Phone: (Off)2376 2121, 2376 1212. Manager: A.K.Murugesan. Cell: 98404 51213. Mobile: 94440 10515, 98410 20038. Phone: 2376 5809, Cell: 31024710. Phone: 2490 3867, Mobile: 98410 98657. Phone: 2489 2078, 2471 1330. Phone: 2377 4255, Mobile: 98410 15808. Phone: 2817 0471, Cell: 98400 35964. Phone: 2481 5546. Mobile: 3334 7004, 98410 47004. Hyderabad Phone: 040-2306 5004 Cell: 0-9849447622. Phone: 2841 6453, Cell: 98411 90294. Phone: 2432 3719. Cell: 98400 42964. Phone: 2377 0151. Cell: 98840 21600. Telefax: 2377 5336. T.Nagar, Chennai - 600 01. Phone: (R) 2233 2866. (O) 2371 5459, 2471 5914. Cell: 98400 95690. ICC cricket world cup 2011 Schedule. Click the pictures to view in large text. Salim Ahmed Ghoush, better known by his stage name Cochin Haneefa (22 April 1951 – 2 February 2010) was an Indian film actor, director, and screenwriter. He started his career in the 1970s mainly portraying villainous roles, before going on to become one of the most popular comedians of Malayalam cinema.He has acted in more than 300 films in Malayalam, Tamil and Hindi.Haneefa died on 2 February 2010, aged 58, in Chennai, from multiple organ failure. He had been treated for liver cancer.He is survived by his wife Fasila and twin children Safa and Marwa.